The following is a transcription of a newspaper report of this George Nunn's suicide attempt. He was the grandson of Josiah Nunn but just who his parents were has not been established. It seems possible George was the base child of one of Josiah's daughters. Just which of his daughters will probably never been known but I suggest Anne as the best candidate. She would have been about 19 when George was born. As an aside she did not marry and died aged 56. Bury Free Press 23 June 1923 - Page 2. Thingoe Petty Sessions. Chevington carrier's self-wounding. On condition that his relatives took care of him a charge of attempted suicide on June 8th was dismissed in respect of a Chevington carrier named George Nunn (38), who appeared at the Thingoe Petty Sessions at the Shire Hall, Bury St. Edmund's, on Wednesday, before Major F.W.Duff (chairman), the Mayor of Bury (Ald J.Ridley Hooper), Major H.F.B.Archer, Mr. R.J.Burrell, Mr T.Bower, Mr. R.H.Lucas and Col. Parry Crooke. 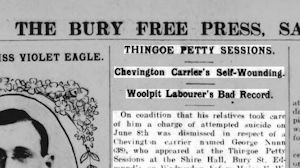 Charles Nunn, agricultural labourer, Chevington, and uncle of the defendant, said that George Nunn was living with him on the 8th June. Witness went to work as usual, leaving his nephew apparently all right. On returning home shortly after 6p.m. defendant shouted to him, "Don't come upstairs; I have made a mess. Go for Martin Cross." Witness complied, and Cross returned to the house with him and preceded him upstairs. Cross told witness to go for the policeman and to take his nephew to hospital. Witness did not see his nephew, as he rushed for the police. Accused had been much depressed of late and could not sleep, rest or eat. He had a motor, and witness thought he was a good deal worried about it. He had lived with witness for the last six years, and had a bad illness four years ago from which he did not seem to recover. A sister of witness who had kept the house left about a month ago to get married, and this also had worried the nephew. Martin Cross, stockman, living opposite Nunn's house, deposed to being called by the last witness shortly after 6 p.m. on June 8th. He went to Nunn's house, and on going upstairs found George Nunn lying on the bed with his throat cut. Witness asking him what he had done, and he said. "I couldn't help it." A razor was lying in a pool of blood. Witness had known accused for 16 years as a hard-working man of good character, and he had detected no change in him of late. He was a carrier and carter, and owned a motor lorry. Nunn had a white cloth round his neck, and was pressing it to his throat when witness went in. He watched the man til the police came. Nunn told witness that he had been to Bury for a load of coal, but came home without it because he could not wait. He also said that "the motor had been losing money." P.-c. Amos Stiff (Chevington) stated that Charles Nunn came to his station and asked him to go to his house. He made a statement, and witness accompanied him to his house and found George Nunn lying on a bed and hold some blood-stained linen round his neck. On the floor were several handkerchiefs and pieces of linen, and a razor stained with blood. On examination witness found that Nunn had a wound in his throat, which had stopped bleeding. Nunn said, "I am sorry to give you all this trouble. Mr. Stiff: I must have been a fool, I wish I had not done it." Witness took the man to the West Suffolk Hospital. Witness understood that Nunn had been worried a good deal on account of the marriage of his sister, who had been keeping house for 17 years, and also on account of bad trade and loss on his motor. Dr. Winifred Peacey, house surgeon, West Suffolk General Hospital, said she saw Nunn at the hospital at 10.30 on the 8th June. There was a cut on the front of his throat, which witness had stitched up. Witness thought it did not endanger Nunn's life - By Mr. Lucas: It was a superficial wound. The witness added that while in hospital Nunn had been very quiet, but otherwise normal. The chairman, after a brief retirement of the Magistrates, asked if any relative of Nunn was prepared to look after him. And aunt and uncle expressed their willingness to take charge of Nunn, who was accordingly discharged and handed over to their care.